The National Day of Prayer is May 2nd. This year's theme is "Love One Another". Love is frequently the topic of conversation during the beginning of February…we just experienced it first hand, several weeks ago. Whether you celebrate Valentine’s Day or not, there is no mistaking that a specific day focused on love is coming. From jewelry commercials to candy in heart-shaped boxes, the thought and idea of love permeates our culture during the first part of February. But what if we focused on love all year long? What if we took the principles of love and put them into practice during the month of June? Or September? Every day of the year? I don’t mean romantic love. I mean the kind of love that causes us to truly appreciate someone else. To be kind, to sacrifice self, give to others, and desire good things for someone else. Not just in our families, but in our workplaces, schools, churches, and communities. That is exactly what this year’s theme of the National Day of Prayer is calling us to do. LOVE ONE ANOTHER is not just a theme for a day of prayer. It is a calling to each of us to put into practice principles of love every day. Our families need us to LOVE ONE ANOTHER. Our workplaces need us to LOVE ONE ANOTHER. America needs us to LOVE ONE ANOTHER. The world needs us to LOVE ONE ANOTHER. It is a high calling, and one that has the potential to change not only our own personal circles, but America and the world. Where will you pray with us on Thursday, May 2, 2019? Will you join a community gathering or host a gathering in your workplace? Will you attend or help host a gathering in your church? 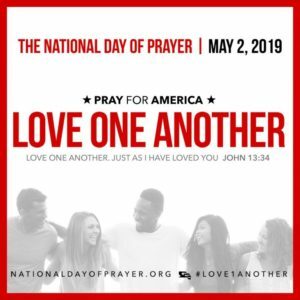 Join with others to pray for America and ask God for a LOVE ONE ANOTHER movement in our families, workplaces, cities, towns, states, and nation. Cry out to God with us on this day. Share with others using the image below and invite others to join you at a prayer gathering on Thursday, May 2.